Bangkok. Ten years ago Julian killed a man and went on the run. Now he manages a Thai boxing club as a front for a drugs operation. Respected in the criminal underworld, deep inside, he feels empty. When Julian’s brother murders an underage prostitute, the police call on retired cop Chang – the Angel of Vengeance. Chang allows the father to kill his daughter’s murderer, then ‘restores order’ by chopping off the man’s right hand. Julian’s mother Crystal – the head of a powerful criminal organization – arrives in Bangkok to collect her son’s body. She dispatches Julian to find his killers and ‘raise hell’. Refn wants to show clearly what he’s good in. Namely bringing a simple story to a higher level by stylistic and artistic tricks. As with “Drive” there is a lot of commotion about this movie and there are pro’s and contra’s of this movie. Refn apparently seems to be a huge fan of David Lynch. Some will consider it as a work of art . Others will qualify it more as complete nonsense and a waste of time when you watch this movie . My opinion lies in between those two and consider it as a great achievement to make an artistic tale of a meaningless story. The intellectual movie audience obviously will give a standing ovation for this one and it will lead to all kinds of theories and opinions. Think long enough about it and you’ll discover a deeper philosophical content with appropriate symbolism . If you don’t think about it too long, it is actually an empty box with careful attention to the correct ISO settings and lenses that were used . Without a doubt , most images are aesthetically pleasing with its esoteric , neon exposures and the numerous moments where the characters are looking silently around. However, most passages are sometimes so absurd and hilarious. The sequence of a murder, the revenge of the daughters father and a Karaoke bar, in that order, gave me on one side a wondering impression and on the other hand I couldn’t suppress to shake my head and chuckle. The karaoke is reused a few times in this movie. I’m still wondering what the symbolic value this has. When you look at the characters it seems like a bunch of autistic persons , who react in the most unnatural way to situations, take their time to give a meaningful response and after that start staring at an infinite point. Each of them master the best “Bold and the Beautiful”-staring technique. Ryan Gosling is actually a duplicate of his character in “Drive . A silent person with the empathy of a good working American fridge. The news about the death of his brother doesn’t even cause a small change in his facial expression. The fact that he’s actually totally harassed and ignored by his mother , raises the same dispassionate attitude . The entire movie is a concatenation and a secure editing of fragments with lots of neon light and proportional masterfully placed image impressions . A snapshot of a belt, a beautiful oriental girl behind red fluorescent beads, a flash of bodybuilders, a karaoke bar, people staring at the ceiling …. Take all the moments away where someone meaningless stares at the horizon and you keep a simple revenge story of roughly 20 minutes. 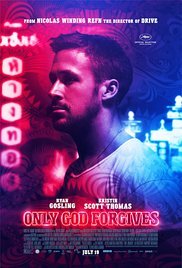 To make it acceptable for a larger audience you throw some bloody fragments in it and a realistic, lively fight where Gosling end up with a rather damaged face. In short : a simple revenge story held together by arty interventions. In my view, not such a work of art as it should appear to be.